The glow of a beautiful evening in nature is depicted through watercolor on these one-of-a-kind evening glow wedding invitations. Stars light up the sky. The watercolor design shapes the clouds and dark night sky. Perfect for your wedding under the stars. Your wording is printed in white in your choice of fonts. Great quality for a low price. Very pleased. Quick, quality, and inexpensive- you CAN have all three! I loved the design of these invitations- both the print and the foldable style. After the standard paper in the sample order felt a little insubstantial, I upgraded to the heavy matte. The invitations arrived less than a week after I ordered, and look fantastic. Best of all, I realized after placing my order on a holiday weekend that I had made an error in the wording. I contacted Ann's via the chat feature a few days later, on the next business day. Laura was super helpful and after confirming the order hadn't gone to print yet, she corrected my mistake, and within 15 minutes sent me a free digital proof to confirm before the invitations went to print. Great product, fabulous customer service, and the price can't be beat. Surpassed my expectations and fit within my budget perfectly!!! I am incredibly impressed with my Evening Glow seal-and-sends!!! First of all, the concept of a seal-and-send wedding invite is genius!! With this style of invitation there is no need for an envelope and the response card detaches for guests to mail back. These invitations are beautiful and turned out exactly as I had hoped. I just placed the order on May 13th and I received the invitations in the mail yesterday, May 18th; that's fast considering I only selected standard shipping. I'm pleased with how quickly my order was processed!!! I took advantage of a discount coupon code that was available for Mother's Day that gave me 30% off my order total!! Because of this coupon code I was able to upgrade to the shimmer paper, as another reviewer suggested, and I highly recommend doing this. 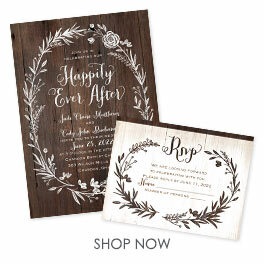 The shimmer paper gives the invitations a soft, elegant touch. 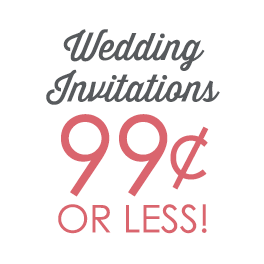 I would recommend Ann's Bridal Bargains to any bride regardless of their budget! I used the upgraded paper, which is shimmery, and adds a gorgeous effect with the evening glow background. The order came on time without any mistakes. The only thing I can add is that the "tear apart RSVP card" has been confusing to a few of our older guests. I would highly recommend the product!